I enjoy a slice of pizza as much as the next person (perhaps a bit more). The key to a good pizza is the raw materials- use the right stuff, and you'll be happy every time. What's great about pizza is that it has all sorts of great stuff on it, and presents them all in a single, easy to hold and eat meal. Data integration can be like a really well put together pizza- lots of good cross-referencing cheese-data to keep everything in its place, great crust that supports it all, and a universal appeal that might even get people to try something they wouldn't normally consume (data wise). But without data quality, data integration can make pizza that nobody really wants to eat, and rather than enhancing the value of your data, your data integration efforts can make your bad data even less consumable than it was on its own. While combining data from multiple systems can generate huge insights, it is important to understand that moving it and combining it with data from other systems will not always increase its value. With good quality data you can have fantastic results, but bad quality data requires so much effort and transformation that often your payback on doing the integration will be non-existent. So what happens when an enterprise hears its stomach rumble, and starts thinking data pizza? Enthusiastic analysts spring into action, building various mockups of all the fantastic dashboards that they will be able to produce, once the data integration is done. Terms like "near-real time, balanced, cross-functional score cards" start to get bounced around, and pretty soon, budget proposals and appropriation requests are flying from color printers everywhere. Whats unfortunate in many cases is that cooler heads don't stop to ask the question- "So... all this data we are going to put together, is it any good?" When you are making your pizza, you have to know if the cheese has been left out a bit too long or the green pepper is soggy. What can be worse, is that if heroic measures are taken to try to get the data to fit together, the integration jobs themselves might actually degrade the data quality further- or eliminate levels of detail that are not compatible, actually hiding important trends and structures. 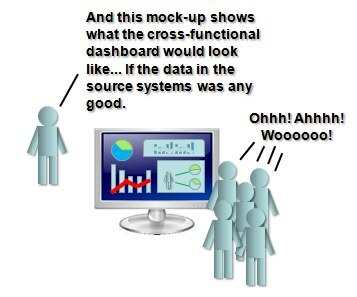 A risk of integrated dashboards is that they pander to the lowest common denominator. So if you are planning to do some data integration, to build a data pizza, think twice about putting that moldy pepperoni from the CRM system on it- sometimes less is more. In fact, it might be that data integration is not your first concern- improving the quality of the data in all those data silos will actually improve day to day operations immediately- and make any future data integration project cheaper, and more successful. Any great chef will tell you- no matter how complex the recipe, and how impressive your kitchen and equipment, the raw ingredients matter. I delivered my very first professional presentation in elementary school (i.e., primary school to most of the rest of the world) on the subject of the under-appreciated nutritional benefits of pizza. If I had today's technology available to me back then, I could have created an awesome multi-media presentation and a mock-up of a "near-real time, balanced, cross-functional score card", posted it all on my blog, YouTube, Facebook, and I would have become a regular trending topic on Twitter like Justin Bieber (back before Twitter changed the trending topic logic -- thankfully, sorry Justin 🙂 ). What were we talking about again? Oh right, how data integration is like pizza! Yes, I definitely agree. Just like quality ingredients are the key to great pizza, quality data is essential to great integration projects. As a lifelong pizza aficionado, I can also attest that even heroic measures can not save an incompatible list of ingredients haphazardly tossed into a pizza-like shape (and don't even get me started on Tofu pizza -- that's NOT pizza! -- go to your happy place, Chicago-style deep dish, ah, that's better). Back on point, data is the raw ingredient in whatever enterprise information initiative you are planning, so like you said, no matter how complex the recipe, nor how impressive your kitchen and equipment, it is the raw ingredients that matter most. P.S. As Homer Jay Simpson would say: "Mmmmmmm, data pizza." So just to be clear- Tofu (as long as it is high quality) could be used on pizza- but if you invite Jim please have an alternate available. Thank you.